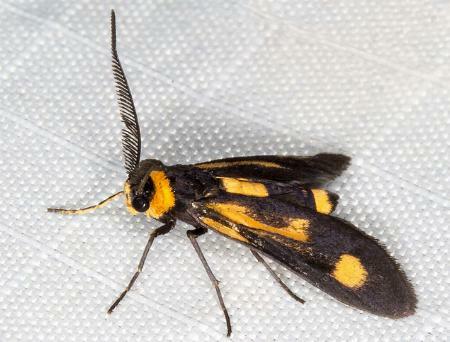 The adult moth of this species is rather wasp-like, having a black body with some yellow bands, and a yellow collar around its head. 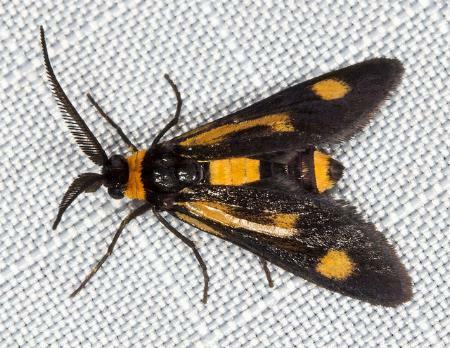 The wings are black, with a yellow exclamation mark (stripe and spot) along the length of each forewing, and a big yellow patch on each hindwing. The wingspan is about 2 cms. Moths of Australia, Melbourne University Press, 1990, fig. 28.16, pp. 297-298. Series 2, Volume 1, Part 3 (1886), p. 789, No. 145. Zygaenid moths of Australia, CSIRO Publishing 2004.